Hey, what’s your sign? Whether you’re a passionate Leo or a free-spirited Pisces, there’s a lot to learn (or at least have fun with!) from your Zodiac sign. 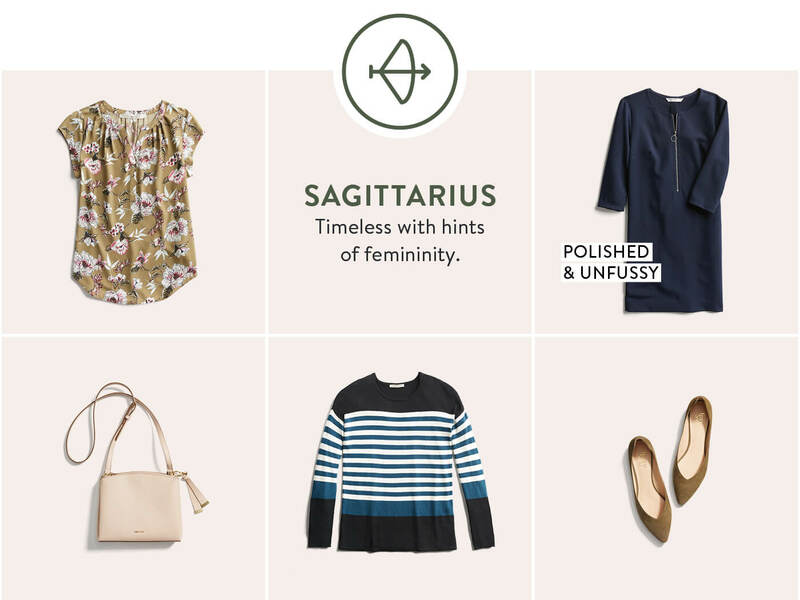 We don’t know what the stars have in store for you at work or in love—but we do see a very stylish year ahead. 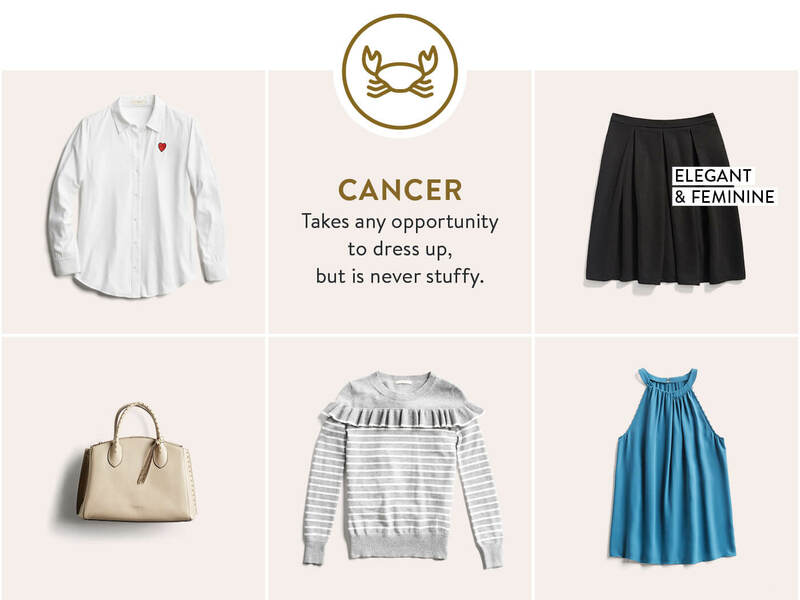 Click on your sign to learn more about your stylish year ahead! Simply sophisticated. 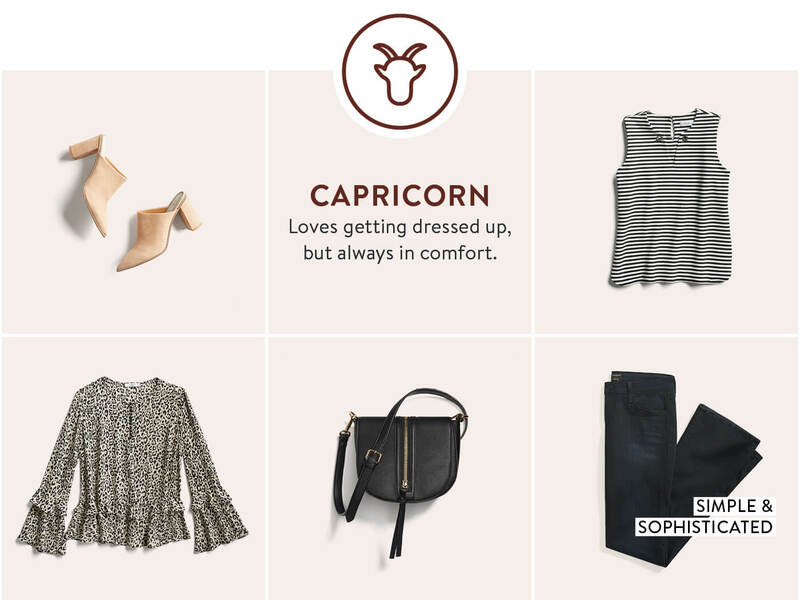 Capricorns love comfortable pieces with a twist. 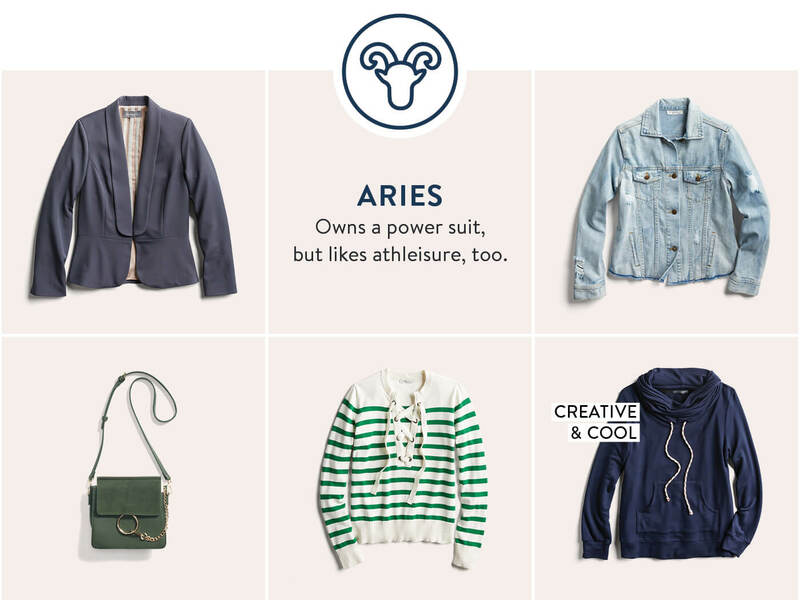 Capricorns are all about that cozy, cozy comfort—which makes sense since your sign is rockin’ out in the depths of winter. In the new year, update tried and true basics with a little twist—like a new shoe style (mules anyone?) or even new jeans in a totally on-trend style. When it comes to your style, take a walk on the wild side and experiment with bold prints and colors to show off the *intense* part of your personality. It’s all about shining the spotlight on you, so use your personal style to soak up the much-deserved attention. 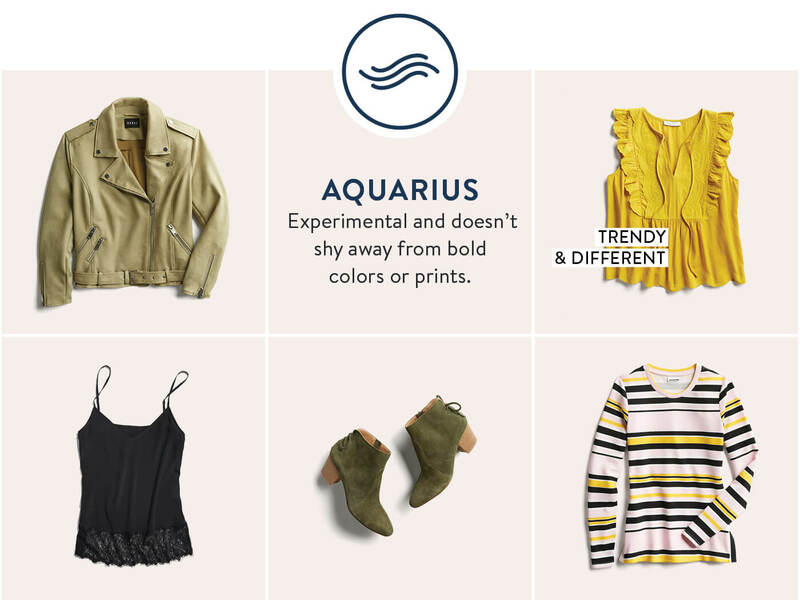 Shine on, Aquarius! Oh, you free-spirited, fun-loving gal, you. Not only do people gravitate towards your good natured humor, your love of life and warm personality, but they get serious style FOMO from you, too. Always one to be eye-catching, but never over-the-top, this year it’s all about adding flowing silhouettes and an easy-breezy vibe to your wardrobe. 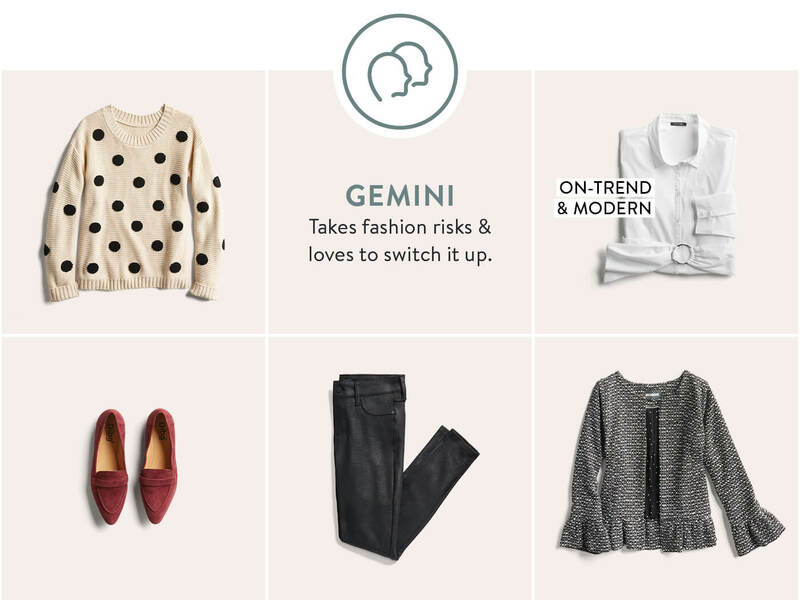 You can go from 0 to 100, real quick (with your style)—in all the right ways. You’re the master of creating a seamless look that takes your from desk to date and from date to a weekend out with friend. You’re the chameleon of the fashion world! This year focus on your basics so you can keep up the good work. Do you have a fashion blog yet? 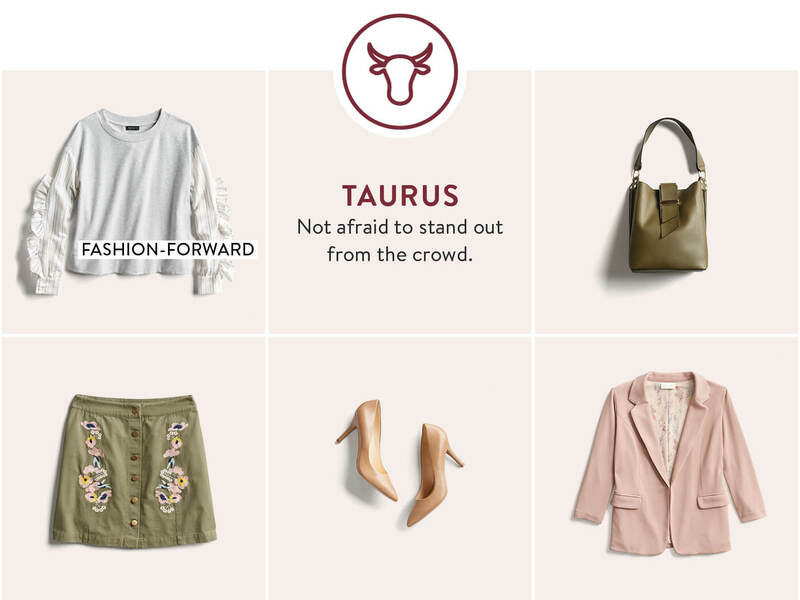 A Taurus is always fashion-forward and loves to make a statement with their daily style. This year, look to wow pieces with impact that can stand the test of time. Whether it’s on the (pavement) runway or your next 9-to-5, own your style and reap the rewards of confidence. Never a wallflower, a Gemini takes pleasure in wearing pieces that turn heads and have people asking questions. Specifically, “What are you wearing? 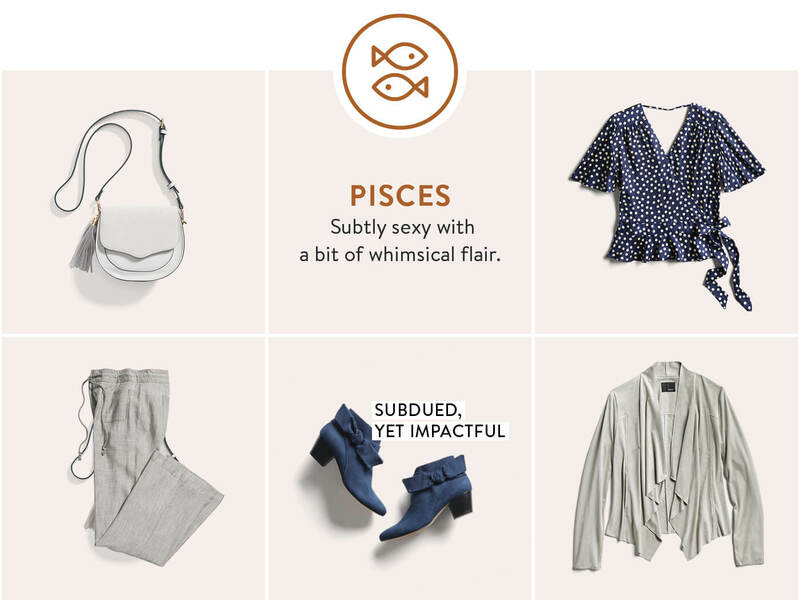 And, where did you get that?” You answer of course, “Stitch Fix.” Keep it up! This is your year to take proportion play, volume and silhouette experimentation to a whole new level. You keep it poised and poised and polished 24/7 with a refined sense of style. Always count on a Cancer to be the most overdressed in the room! You’re a sophisticated, classy dame, with an eye for clean lines and a timeless, classic appeal. This year, challenge yourself and pair your sharpest essentials with relaxed staples—like a borrowed from the boys button-up or a blouse with a bohemian twist. Need pointers? Talk to your friend the Pisces. Leos are notorious for their fiery, headstrong personalities. Often one to hold a grudge, they’re usually more bark than bite. But, don’t fear the fearless, Leo—they are the most loyal of friends—and someone you want in your #squad. 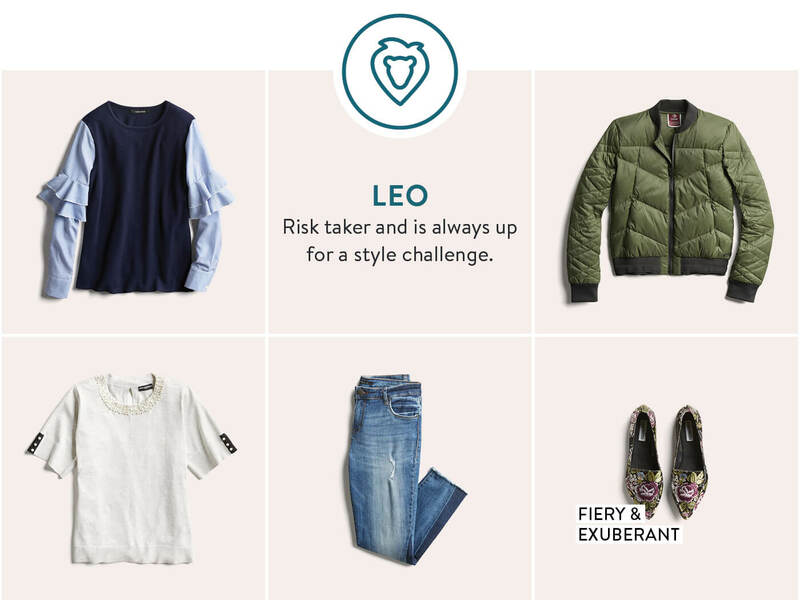 Oh, Leo, let your creativity, passion and ultimate zest for life, love and attention translate into a bold new wardrobe. 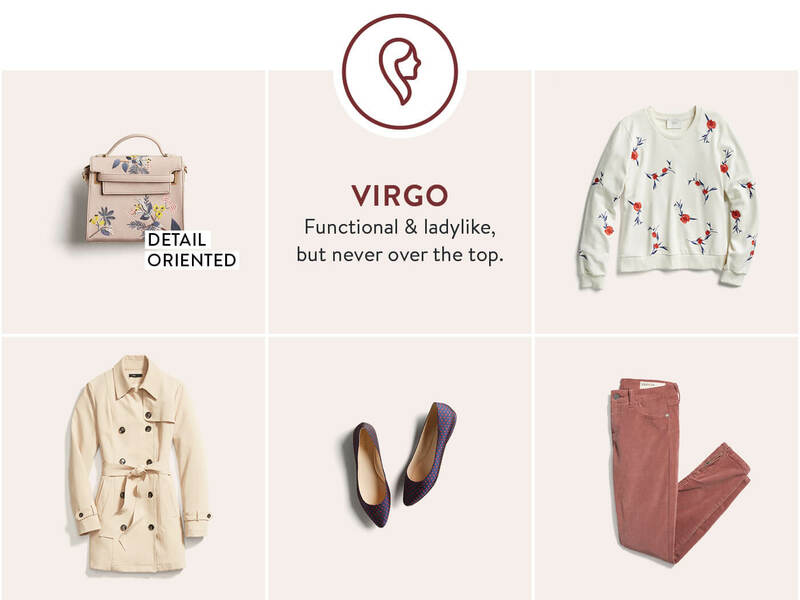 Virgo, you have a deep love of the classics and gravitate toward tailored silhouettes. Channel your two power colors this year (red and ivory!) to add something unusual to your typical style. Always polished and grown-up, you have a way that says “look at me” but is never overdone. Your subtle style restraint will result in your signature, lady in red look this year. Always living on the edge! 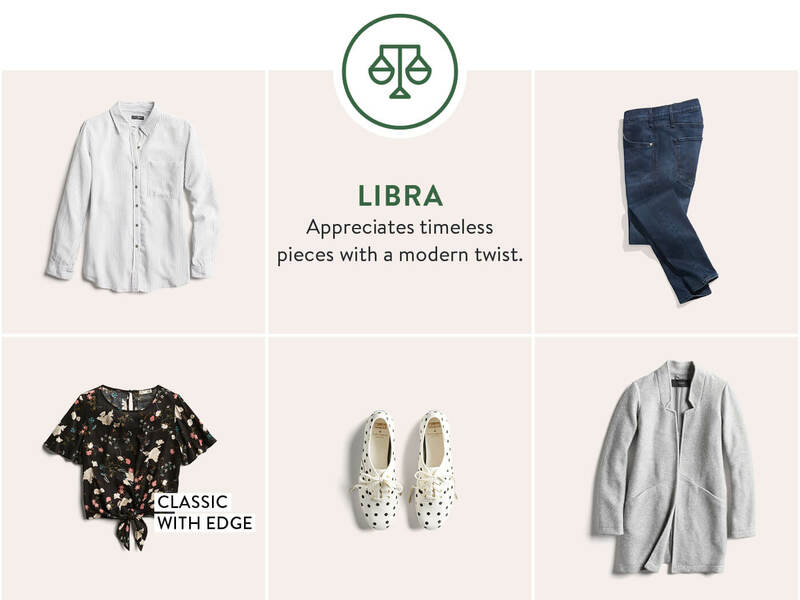 The wild child of the bunch, Libras are never afraid to go to the dark(er) side of their closet. Greys, blacks and navys are staples in your wardrobe and this year, keep adding edgy details to your outfits like studs, metallic trims and leather accents. Then, offset those hard lines with a bit of softness too—like a lace or velvet blouse. You’re a bonafide goofball with an enviable sense of humor—and this translates to your style as well. Hone your penchant for polished yet unfussy style and gravitate toward clean, feminine silhouettes in the new year. Then, push your style boundaries this year by adding in brave (and bolder) silhouettes and statement accessories. A master of uniforms and always polished to perfection 24/7. One of the most mysterious signs in the Zodiac, you take this quality into your style. 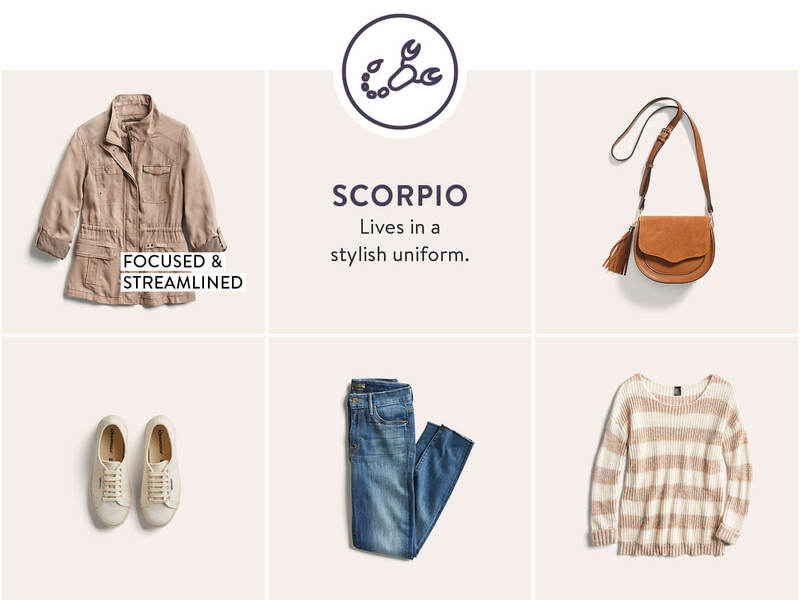 Scorpios have an uncanny knack for being put-together 24/7—how do you do it? You’re a creature of habit when it comes to getting dressed, so keep your favorites close this year. Your style challenge? Don’t be afraid to add in a splash of something mysterious (just like you) into your closet this year. What do you think about your star-crossed style? Tell us!